Opening the window to savour the spring morning air, I settled down to write. 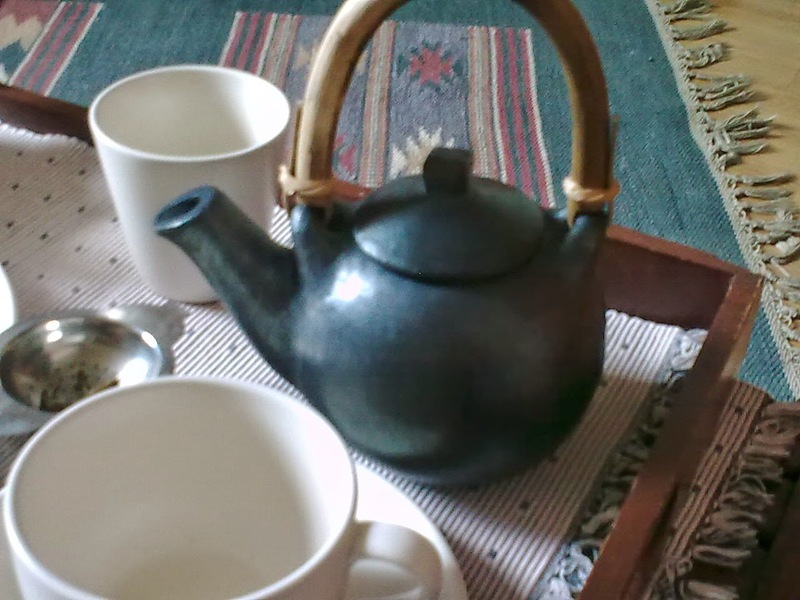 There was a pot of Japanese Genmaicha tea by my side to accompany this daily, early morning, routine. I hadn't been feeling too good. Things had been crowding my mind and I needed to be more sensitive to what was churning within; it had been making me nauseous these past few days. So I opted out of my usual Darjeeling tea. The caffeine in it stimulates me. And the green Sensa leaves with the roasted rice, which makes the essential Genmaicha, would help me de-toxify. 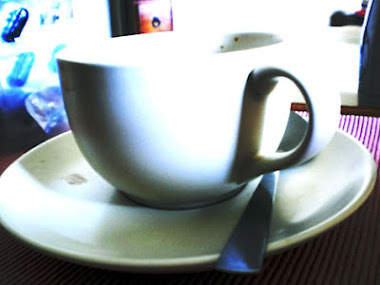 Sans the caffeine in that regular cup of chai, I could hope for a subtler state of mind to observe more closely what was going on inside my head. I had also decided to fast to aid the detox process. Sencha has a flavour that's close to that of a salt-less broth of boiled veggies and is an acquired flavour. I like it: the toasted rice adds such a wonderful aroma to Genmaicha and also enhances the otherwise ascetic taste of green tea. I first tasted this in Japan in the late 1980's and revisited the flavour on another visit in 1996. The hotel we stayed in Tokyo had a supply of powder that served as green tea. You could heat the water and make yourself some. And that is what I did each day. My taste for Genmaicha and preference for it over the Sencha green tea, I acquired on a trip to Boston in 1998, where my younger sister used to live. She introduced me to it and I carried back a supply of circular tea-bags made especially for the American market. But they didn't last long. A lot of people in Delhi drink green tea these days and you can buy it almost everywhere - flavoured with mangoes and apples and more. But this isn't the same green tea made with the Japanese Sencha leaves. 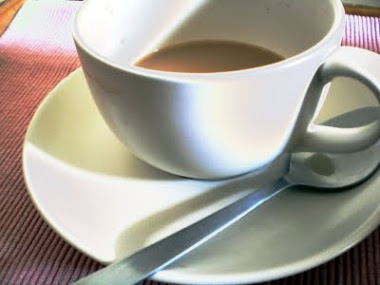 Most of it is made with young Assam tea leaves or Darjeeling - of the Camellia variety. But Mittals in Sunder Nagar always has some of the authentic stuff. Not the powdered variety but the leaf. And Vikram Mittal is ever-obliging to get some if he doesn't have it in stock. My mornings are precious for the serenity of being awake while most people are asleep. But this morning a bird flew into my bedroom. I was charmed. It’s impossible to capture them on camera usually, so I sat very still. 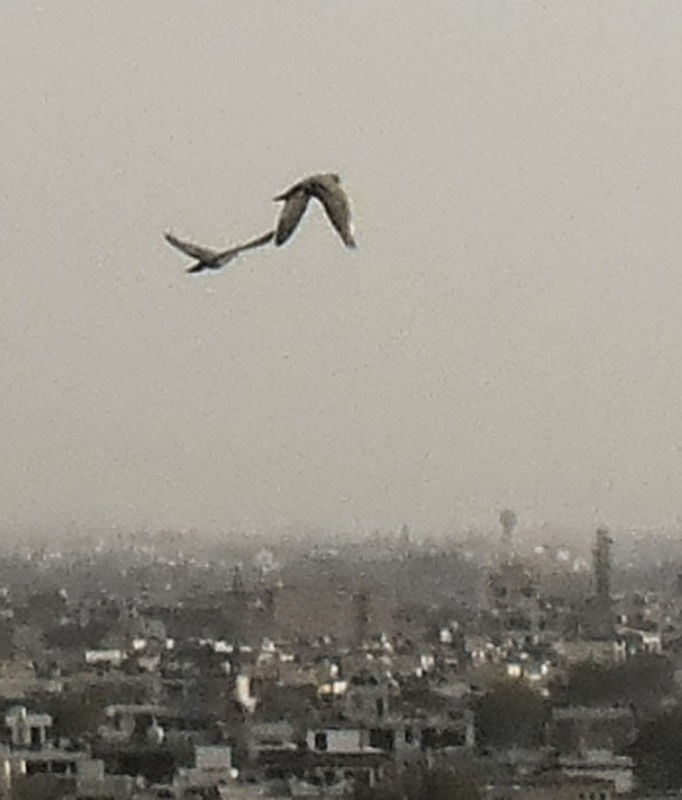 I took out my phone and, was busy photographing it, when I realised doing this could go on forever and captive or not, a bird is a bird whose wings will always flap. I didn't get very good images either. This was partly because fabulous as the i-phone camera is, it doesn't have my Nikon's 42x zoom [which was in another room and I didn’t want to miss the moment or scare the bird by opening the door etc], and partly because the bird was moving constantly! Very quietly, I got up from my bed and ventured closer. I walked slowly and without my chappals, as soundlessly as I could, but it darted here and there and kept hitting itself against the glass. I reached out to open the window wide, but when it took a leap of wing, it was always on the side of the glass that wasn't open - the wrong side. I think that this family of birds is quite silly. They are also a nuisance for those of us living in high-rises because they crap and mate in every nook and cranny and eat almost anything, including cement and my lovely green-plant leaves. I try and get around that by feeling them bajra every morning, which is why they sit on the ledge outside my bedroom window each morning. Sometimes they knock on the window to remind me that I am late in feeding them, but none has ventured further than that and neither do I encourage it. 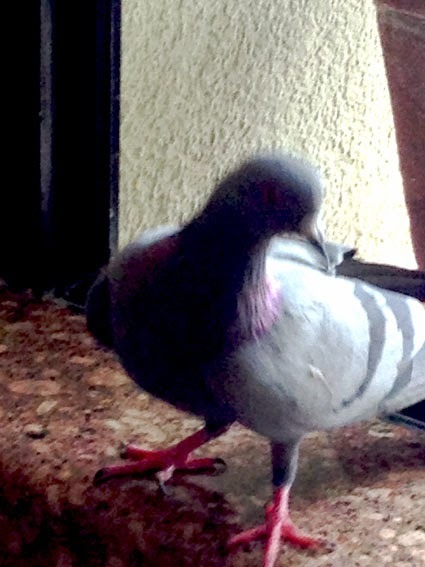 This morning, this hapless pigeon popped into my room uninvited, however unwittingly. And I was as surprised as it was. 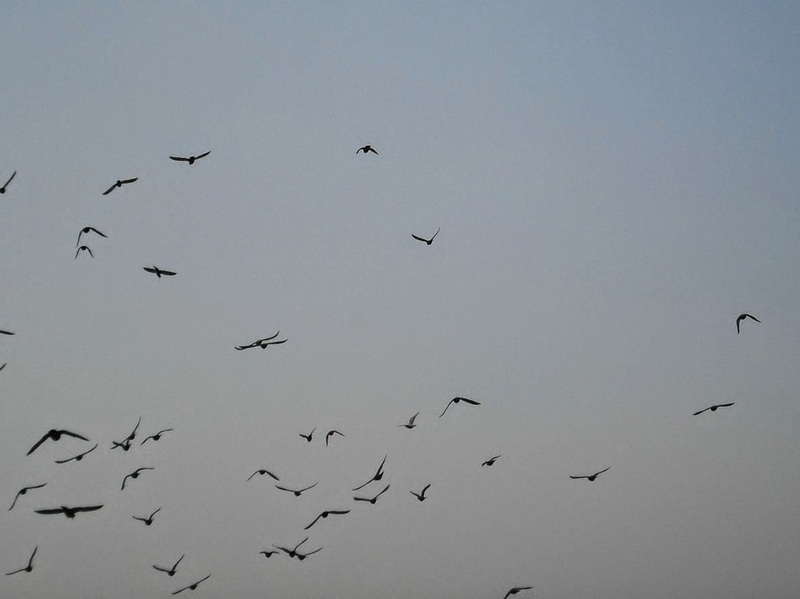 Whether or not I liked these birds, the fact was that it seemed so lost and I could sense and see that it wanted help. It was, after all, in my domain, so instead of distastefully shooing it away; compassion got the better of me. I tried to reassure the creature. I spoke softly. I measured my tone of voice to calm its ruffled feathers. Saying as gently as I could, "Give me a chance to hold you." I didn't want to grab it and chuck it out. And even if I wanted to I couldn’t have. The pigeon grey with those mesmerising and constantly changing hues of teal into purple and grey, which graced its neck, kept me glued. 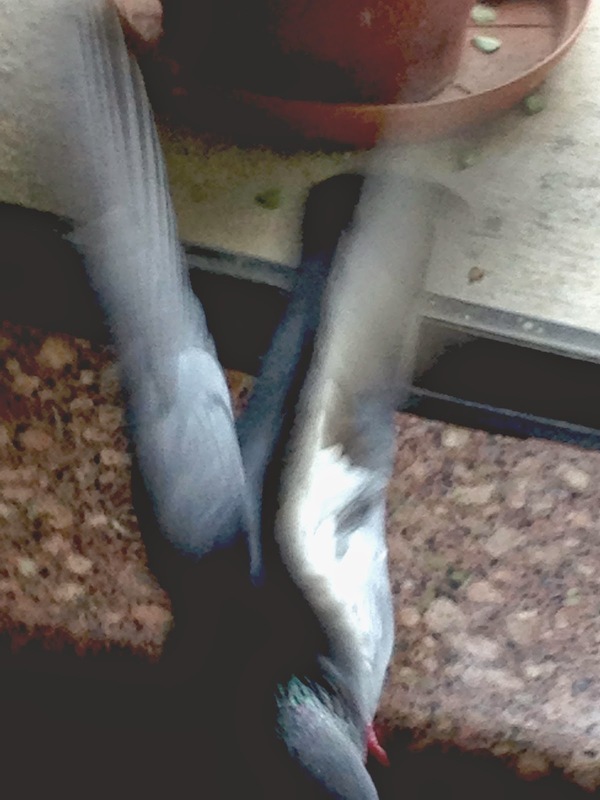 I still wanted a picture but the pigeon felt trapped, so my priority was to set it free. It was scared. In that state of panic it fluttered and hit the glass, in a desperation I didn’t think it should have felt (after all, I was trying to reassure it and set it free). The vicious sound of its beak banging against the glass coupled with those fluttering wings was distressing. I became aware of a sense of fear welling up inside of me. How would I hold it, its claws are so pinkly creepy. What if it hurts me? When living creatures, including human beings, perceive themselves under threat or feel defenceless they tend lash out and that that is what I have seen them do. So I was afraid. I didn’t know quite what to expect! I quelled my sense of unease and bent lower, as softly and as gently as I could. I stilled my mind, made it resolute to catch the bird. But I was squeamish and wondered how they caught those terrified chickens in the slaughter house. The thought of that throbbing feathered thing, struggling in my palms, in total distrust of me [I must seem like a giant to this tiny creature], began to disturb me . I started feeling the fear in a way that was unnerving. How could I be so afraid of a frightened bird, of such minuscule dimensions? Noting this was not reassuring for me. My own negative self-talk was beginning its rancour. But it was trapped in my house, trapping me in my own fear and I had to do something. I kept whispering, "Let me help you, please help me set you free. I’m not going to hurt you, I‘m a friend here. Just stay still for a moment, I'll just hold you and promise not to hurt you. I just want to set us both free." But I couldn't bring myself to get a hold of the pigeon. I just couldn't grasp that fluttering body, so restive, so scared. I moved back after a while. And it leapt up into the air, hitting itself on the wrong side of the window, yet again. I thought I should try and slide the glass and open the side it seemed to prefer. I was, however, surprised that it didn't even seem to sense the open spring air wafting in from the other side. I had to lean over. There was no way I could do it without the menacing movement of arching my large frame over that tiny and terrified soul. And sure enough, in its defence, it lunged at me, terrifying me further. All through this I was silently chiding myself for allowing its fear to rattle me. But it did. And I wondered if it could not sense the breeze on the open side of the window, could it sense my fear? Or was it too caught up in its own anxiety of not being able to return to the skies again? It had now reached a point, where I could not get back to what I needed to do with my life until I had dealt with the bird - set it free. 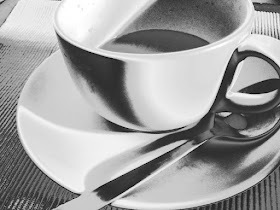 My mornings are precious and writing at that time is sublime, effortless and insightful. Almost as if in the quietude of mind, rested by sleep and the silence of a world still not fully awake to itself, my souls speaks easier to me. 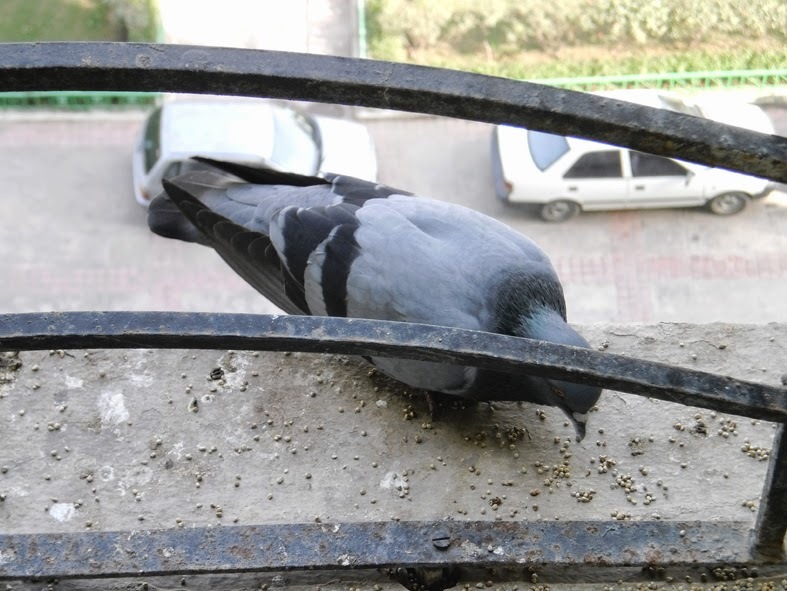 I was getting upset with the pigeon - this hapless creature that had invaded my space. The earlier charm of capturing it on camera, getting that closer look at its feathers et al, was giving way to irritation - just slight, but it was there. I kept reminding myself, the bird was a messenger. The universe had sent this feathered friend to help me, to show me the way. I tried to look back in mind, of thoughts it could be addressing, which wasn't easy to do when I was also trying to concentrate on the task of helping the flapping bird fly out. But the idea calmed me a little. And that sort of helped but, I still couldn't bring myself to hold those fluttering wings. I was chicken and not very proud of myself for it. There had to be a way! There was no-one else around. Mahipal would not be here for a couple of hours at least. I had to put my mind to it and get it done. This was something I had to do for myself today. And then I found a piece of card - it was always there but just then its whiteness gleamed and caught my eye. About eighteen inches or so, not quite a square, it was light enough not to hurt the bird yet large enough to encourage it to leap, guiding with its form, to fly up in the right direction. And in that instant, with the help of that white card, carefully holding it such that it didn't touch the bird but just nudged it in the right direction, I managed to do it. 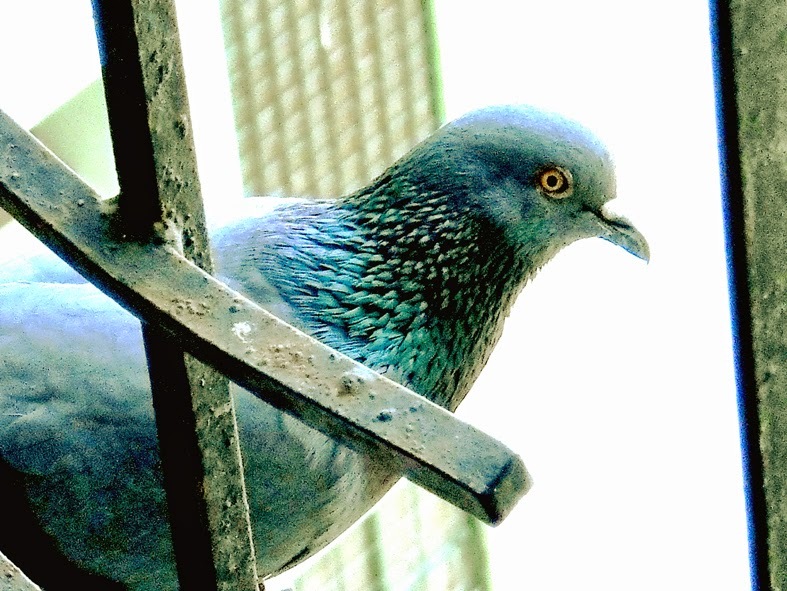 The grey pigeon flew out of the window. With its peacock coloured neck and that clear dot of white on its pincers and those creepy looking pink claws, it found its way out into the sky. For a moment it was stunned. Or so it seemed, for it turned back for an instant and I imagined this was in disbelief, that it was finally free. I mean could there ever be regret for an experience where it engaged with me only in fear? I was relieved. I could now reclaim what was left of the early morning calm. But my sense of relief was brief. Not only had the bird disrupted my precious routine, I now had to tackle that fear in me that had been excavated in engaging with it! Yes, excavated - not embedded by the experience just narrated. Unknown to me, fear existed. The bird had been a messenger from the universe - a catalyst for me to be able to see this – for only then could I set myself free. Now that the bird had returned to the skies, it was my turn. Yes, Julia that is always an option - to leave people and creatures to their own devices and sometimes one must do that too....:-) but there are somethings that demand attention just like this did - out of curiosity and wanting to capture the colours etc. Besides my dear, if we did leave everything the way it is, then would we not lose the opportunity to discover ourselves? But next time something like this happens, I shall try and see if I can sit back and watch the drama without getting involved! :-) Would be a useful exercise in itself.... I'm sure. Thanks, as always, for reading and writing your thoughts on the post. Always a pleasure to read. very engrossing read. write a book Gopika, this is a gift of God - to be able to write so beautifully and capture somebody's attention in this busy life we lead. its nice that your are in a place with the windows wide open, no screens, and your place is so inviting, naturally a bird would want to come and share the space with you. I think Alfred Hitchcock's "The Birds" has brought a sense of irrational and unpredictable danger to the everyday bird. Thanks Kathryn. Yes, I refuse to get the wire mesh put in. My maali [gardener]keeps trying to get me to do that which would reduce his workload a great deal but I cannot bear to be trapped in like that. Some people have enclosed their verandas with a plastic mesh. I had thought of it because the pigeon poop is such a nuisance, but then I couldn't do it! 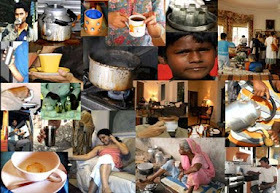 Basunadara, many thanks for reading. I am so glad that you enjoyed it.